Premier Rachel Notley regularly needles Ottawa these days to “step up” and improve oil transportation in Canada, turning the Trudeau government into Alberta’s pipeline pincushion. There’s a reason for the frequent digs. Albertans overwhelmingly believe the federal government isn’t doing enough to ensure pipelines get built — along with half of all Canadians — even with Ottawa’s $4.5-billion purchase of the Trans Mountain project. A new poll by the Angus Reid Institute released Wednesday paints a picture of a country that increasingly understands the economic imperative of building energy infrastructure in Canada. It indicates the public opinion on the need to build new oil pipelines is slowly being won across much of the country — with the exception of Quebec, where opposition remains strong. “It shows an increased sense of urgency and anxiety that now starts to cross what we might consider to be the usual Alberta-Saskatchewan divide,” said Shachi Kurl, institute executive director. The online survey of 4,024 Canadians found almost six in 10 — including 87 per cent of Albertans — believe the lack of new oil pipeline capacity is a crisis, something the prime minister acknowledged during a recent trip to Calgary. A majority exists in nearly every region of the country, with only Quebec bucking the trend. 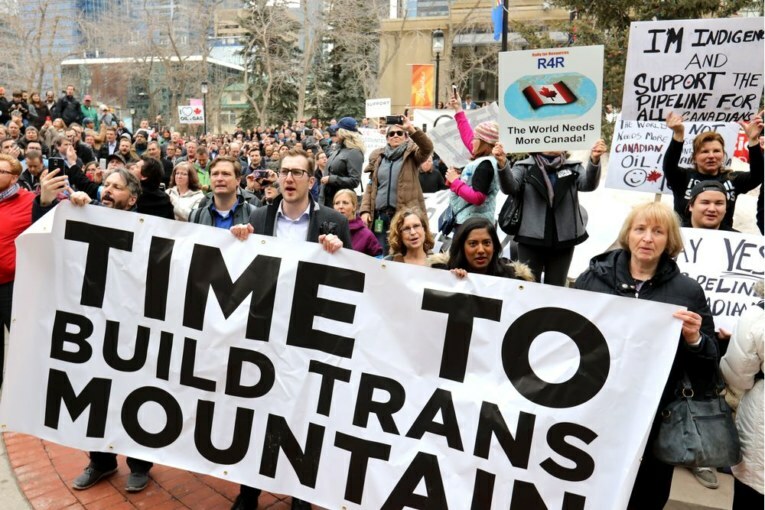 Even in British Columbia, the centre of protests against the Trans Mountain expansion, 53 per cent consider the situation a crisis. Younger Canadians are much less likely to feel there’s not a problem, reflecting a demographic divide. “There is no doubt the mushy middle is starting to harden,” Kurl said. So how is the federal government faring on this file? Poorly, despite their attempt to balance the economy and environment on this thorny policy matter. Half of all Canadians surveyed say the Trudeau government is doing too little to build new pipeline capacity. Another 27 per cent believe they are pushing too hard. Only 23 per cent say the Liberals have attained the Goldilocks position of getting its approach just right. In Alberta, where the pain caused by the oil-price discount has led to a drop in investment and employment — and caused the province to curtail crude output — it’s a blowout in terms of where public sentiment lands. Of the 719 Albertans surveyed, some 83 per cent say Ottawa is not doing enough. In British Columbia, 46 per cent agree. Despite vocal pockets of anti-fossil-fuel opposition, most Canadians believe oil and gas is vitally important to the country. When presented with seven different economic sectors, almost two-thirds say they think oil and natural gas is one of the most critical to Canada, including 91 per cent in Alberta, where thousands of jobs depend on energy development. Energy was the top selection in every province but Quebec, which selected agriculture. Now, these results don’t mean most Canadians will go to bed tonight dreaming about building large-diameter pipelines. Asked what is the top issue facing their province today, the cost of living, health care and the economy took top spots across the country. But if no new oil pipeline capacity was added, almost seven in 10 Canadians said it would have “considerable impact” on the country’s economy. In Alberta, an eye-popping 96 per cent say not building new pipelines would have a major or considerable impact on the provincial economy. As for the effect on their own provinces, that figure sat at 63 per cent in B.C., 58 per cent in Atlantic Canada and 55 per cent in Ontario. Again, a majority in every region believe a lack of pipelines will have a considerable effect on their provincial economies, with Quebec the outlier. In other words, Alberta’s message about the strategic necessity of getting more oil to tidewater is largely getting through. And as more Canadians believe pipelines matter, a majority want to see both Trans Mountain and the now-defunct Energy East project built. The survey found 53 per cent of Canadians support both the Trans Mountain pipeline expansion and TransCanada’s Energy East project. On the other side, about one in five oppose both projects. The online poll, conducted between Dec. 21 and Jan. 3, contains some promising trends for those who want to see new energy pipelines completed. Oil and gas leaders believe ongoing efforts such as Alberta’s campaign across the country touting the benefits of the Trans Mountain expansion are having an effect, along with more direct communication from the sector. “There seems to be more interest about what are the benefits of a pipelines versus rail and trucks. I think people are generally getting it,” said Andy Mah, CEO of Advantage Oil & Gas. Modern Resources CEO Chris Slubicki said most Canadians are frustrated with the lack of pipeline progress and understand the gridlock is costing the country billions of dollars in lost revenues, investment and jobs. “Canadians support consultation and environmental objectives, and so does the energy industry, but at some point you need to make decisions and get some things done,” Slubicki said.